A fast and easy moisture detection of bulk goods can help to optimise processes in production and laboratories and contribute to their economy: storability, processability and quality parameters of many products depend on the amount of water the material contains. The MoistureLab is easy to operate and, nevertheless, satisfies high requirements for precision and reproducibility. Fast and reliable information allows one to optimise process parameters and avoid fluctuations. The MoistureLab is suited for nearly all kinds of bulk goods, such as small or ground tablets. The measurement technique operates, in contrast to many traditional methods, independently of density and temperature. Secondary product characteristics such as colour, structure or mineral content do not influence the measurement either. Measurements are started by use of the integrated touchscreen. The operator is asked to fill the probe via the funnel with the material that is to be measured. 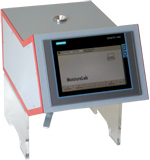 Within seconds, the measurement result is available and displayed on the screen. The extensive software package belonging to MoistureLab enables a quick and problem-free adjustment for different materials, the number of different articles being unlimited. In addition, statistics software allows professional data management and editing. The numerous advantages of the MoistureLab are based on the innovative 2-Parameter Microwave Resonance Technology (2PMR), which uses two parameters - the adjustment of absorption of energy by water molecules in an electromagnetic field and the propagation speed of electromagnetic waves - to determine moisture and density independently. Preparation and exact metering of samples are thus unnecessary and the work-flow may be considerably eased. The material is neither warmed nor otherwise changed by the measurement and thus subsequently can be processed further.